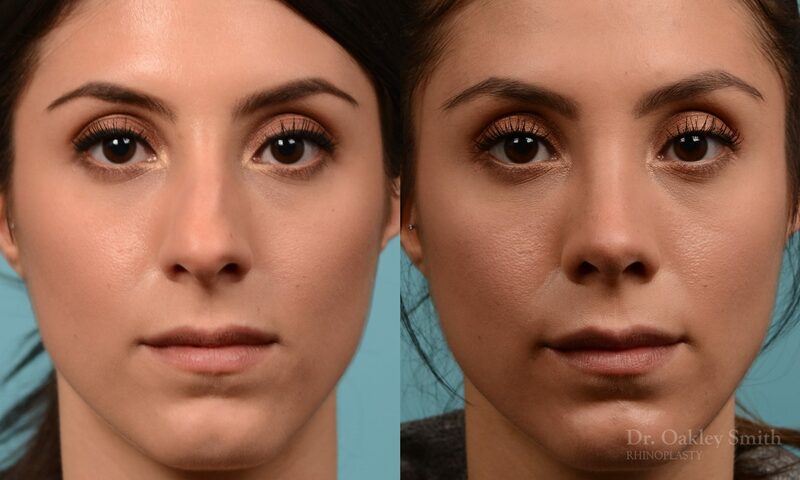 This elegant young lady felt her nose detracted from her natural facial beauty. 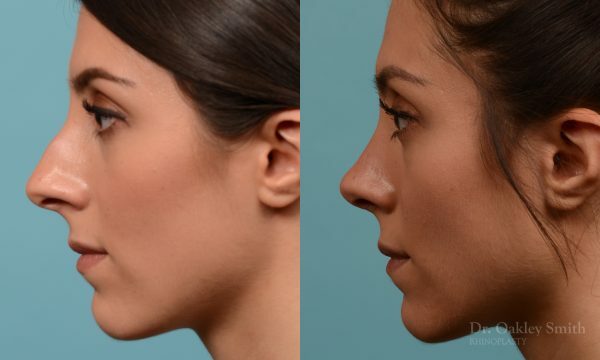 She believed a smaller nose with a softer more feminine appearance would be better. 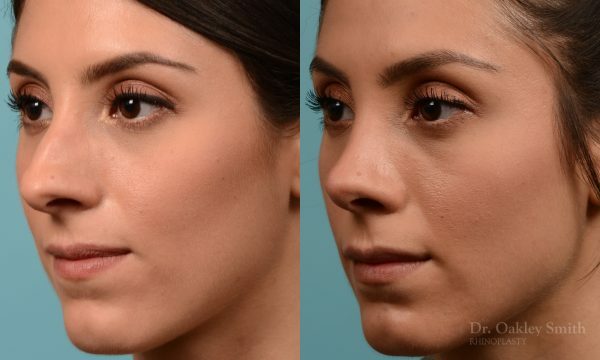 She had near perfect skin for rhinoplasty, neither too thin or too thick. Furthermore she had a vertical facial plane. This is a good feature as it creates the best platform for a nose to sit on. 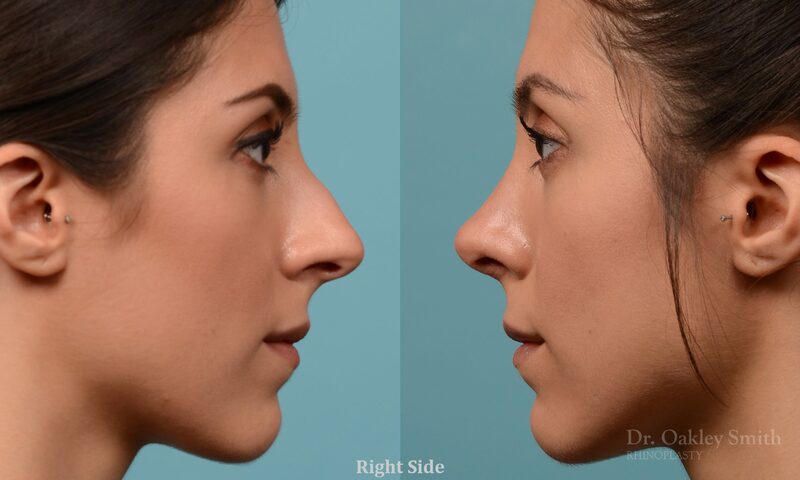 The amount a nose can be made smaller is a judgement which is critical to the success of rhinoplasty. Of all the common requests, this is the one which has the highest probability of falling short of a patient’s expectation. How much a nose can be reduced in size depends on several factors. The thinner the skin, the more reduction possible as the skin is more likely to shrink down to the new and smaller nasal skeleton. That decision requires years of experience to make correctly. Too little and the nose could have been better, too much and the risk of issues increases. How much bone and cartilage can safely be excised is also learned only be experience. The more removed, the weaker the nose becomes. Also the risk of creating poor nasal breathing increases with the reduction. Every time anything is changed or done to a nose there is a degree of uncertainty in outcome. Every manoeuvre carried the possibility of healing in a way or position not wanted or expected by the surgeon. The degree of variation is usually very small with each move but these are additive and hence the more a surgeon does, the more loss of control over the outcome there is. The tip was able to be de-projected by four millimeters. This is a moderate reduction in overall size of a nose. When the nasal bones were broken, the left bony plate dropped into the nose by about half a millimeter. This is sufficient that if left uncorrected, her nose would appear asymmetric and perhaps slightly crooked. Therefore an appropriate piece of crushed cartilage was laid over the depressed bone to smooth out her side wall. 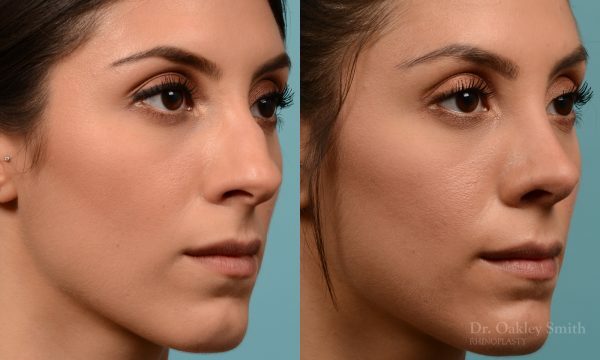 These before and after photos of a reduction rhinoplasty by Dr Oakley Smith in Toronto show how complex rhinoplasty is and the possible improvements which can be achieved.